PEOPLE WHO KEEP UP with news from the world of books may have noticed a story not long ago in The New York Times reporting a controversy surrounding the Arab Novel Prize in Paris. The Arab Novel Prize was created in 2008 by the ambassadors of the Arab countries in France to honor a book by an Arab writer that was either composed in French or translated into French. Each year a jury of literary and cultural worthies, Arab and French and both, has picked the winner. The diplomats have held a ceremony to bestow the award of 15,000 euros, which is not a lot. But it is not a little either, and to be honored is wonderful. This year the jury selected the Algerian writer Boualem Sansal and his novel Rue Darwin, or Darwin Street. The award ceremony was supposed to take place in June, but at the last minute the diplomats cancelled the event and withdrew the money, citing “present events in the Arab world.” Sansal’s publisher, Éditions Gallimard, held a modest ceremony anyway in the publisher’s office a couple of weeks later, and went on to wrap a red paper ribbon around new copies of the book, boasting of the prize and listing the prestigious names of the jury. But there was no money for the prize-winner. One of the jury members wrote an indignant open letter, which ran in Libération, the left-wing newspaper, resigning from the jury and revealing what had taken place. The juror was Olivier Poivre d’Arvor, the director of France Culture, which is France’s equivalent of National Public Radio, except grander. Poivre d’Arvor explained that, between the moment when Sansal’s novel had been selected and the day when the official ceremony was scheduled to occur, a bit of politics had intruded. 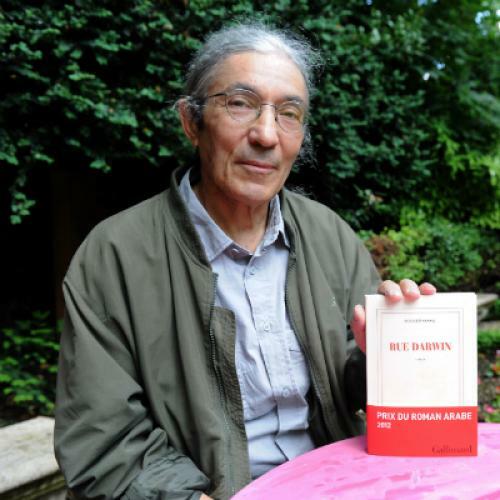 In recent years Boualem Sansal has emerged as Algeria’s best-known writer in the wider world, which is a dramatic development considering that, until the age of fifty, he pursued a career in the Algerian civil service, evidently without difficulty or controversy. But he made the mistake of taking up literature, and, in the dozen years that have followed, controversy seems to have attended him like a shadow. The French learned this in 2008. Every year the big Paris book fair, called the Salon du Livre, selects a different country as its guest of honor, which means that sundry panels and lecturers speak in public about that country’s literature—Chinese literature in 2004, Russian literature in 2005, and so on. In 2008, the country of honor was Israel, in recognition of Israel’s sixtieth anniversary. Unfortunately 2008 also marked the sixtieth anniversary of the Arab League’s boycott of Israel, and the demand arose to boycott the Salon du Livre as well. A variety of Arab publishers launched the call, which was arguably not in their own interest as booksellers. But the publishers heeded what they must have felt was the cause of principle, and they were joined in their call by various individuals and states from Morocco to Iran, not excluding the director of the Algerian Cultural Center in Paris, all of whom righteously declined to participate. Algeria’s most widely known writer, however, interpreted the cause of principle from another angle. He made a show of participating—as if, with a bit of bravado, he could fend off any criticisms heading in his direction. He wanted to speak about a novel that he had just published, which, as it happened, bore on the question of hating the Jews. The novel was called Le Village de l’Allemand, or The Village of the German, because the central figure is an old German Nazi from World War II who, postwar, flees to a new life in Algeria, converts to Islam, and brings up a couple of Algerian sons, whose own story we follow. In the American translation the title has been improved, or so the publishers must suppose, by rendering it, more exotically, as The German Mujahid; and, in the British translation, the title has been improved in the opposite fashion by rendering it, more blandly, as An Unfinished Business—which means that, by now, hardly anyone can remember the title of Sansal’s poor beleaguered novel. The book attracted attention, even so. The German Mujahid tends to be a little schematic, as if, having drawn up a clever plan for his novel, Sansal, the civil-service manager, put too much trust in his outlines and plot diagrams. The book sinks into icky sensationalism now and then. An Algerian son of the old Nazi, upon discovering the truth about his father, ends up dressing himself in striped pajamas and gassing himself to death in the garage, which is too grotesque to be affecting. Still, the furious anger in The German Mujahid is authentic. All the schematic planning in the world could not prevent Sansal from venting a righteous indignation at long-ago Nazis and at present-day Islamists. His enthusiasm for working up big-think political observations is likewise a palpable thing. And it is pleasingly jarring to watch Sansal bring his modern-day Algerian immigrants up against the old Nazis and their Jewish victims. But back to his difficulties at book fairs. No sooner did the jury select his new book Rue Darwin for the prize in 2012 than Sansal returned to his instincts of 2008. The International Writers Festival of Jerusalem invited him to attend and to participate, and he accepted. In May 2012, a month before the assembled diplomats of the Arab League were scheduled to bestow upon him their imprimatur of approval and prestige, he made his way to Israel, spoke his mind on various panels, and hobnobbed with literary colleagues from different countries. The complaint against him this time came from Hamas. In Poivre d’Arvor’s account of these developments, Hamas accused Sansal of committing treason against the Palestinian people. The Arab ambassadors in Paris responded by rescinding their plans for an award ceremony, and Sansal was abruptly “disinvited,” in Poivre d’Arvor’s phrase. This, said Poivre d’Arvor in his open letter, was the “sordid truth” behind the otherwise inexplicable cancellation of the award: kowtowing to Hamas. Poivre d’Arvor also pointed out that, in Algeria, Sansal is regularly insulted and threatened for having written critically about the Algerian state. It is disheartening to observe that books by Algeria’s most widely known writer are no longer published in Algeria. And yet, as Poivre d’Arvor observed, Sansal has bravely continued to live in his own country (where, according to Sansal himself, a good many of his fellow citizens keep abreast of his opinions, even if they cannot easily get hold of his books). Poivre d’Arvor saluted him as “an Algerian writer, free man, impassioned for dialogue,” and, incidentally, the author of a “magnificent text,” namely, Rue Darwin, the prize-winning new novel. Perhaps Poivre d’Arvor could have rendered his letter still more dramatic by adding, as he did not do, a point that you can discover in Salman Rushdie’s new memoir of the Rushdie Affair, Joseph Anton. The memoir reveals that, back in the 1990s, the French government selected Rushdie for a high literary honor, the title of “commander” in the Ordre des Arts et des Lettres. But the French were frightened of the Iranians in those days, and they kept Rushdie’s award a secret even from Rushdie himself, until a few years had gone by and the Iranians were deemed to have become less dangerous. Even then, when Rushdie was told about the award, the French hesitated for a little while to hold a ceremony, and the cultural attaché who put Rushdie on hold was none other than Olivier Poivre d’Arvor. But that was long ago. By June 2012 Poivre d’Arvor had plainly become tired of suppressing literary awards because of objections from violent Islamists. So he published his letter in Libération. The letter stirred a wave of sympathy and solidarity in France, as was correctly reported in The New York Times. The habit of blaming writers from Muslim origins for bringing on their own troubles, which is entrenched in certain quarters of the English-speaking world, seems to run against a French grain. Jean Daniel of Le Nouvel Observateur observed that, by rescinding their literary prize, the Arab diplomats had succeeded in making Sansal into a star. And to be sure, an unnamed person from Switzerland is said to have lately come forward, offering to bestow upon Sansal a consolation prize of 10,000 euros—to which Sansal responded by proposing to donate the money to an Israeli medical charity that serves Palestinian children. There has been talk in the press of Boualem Sansal and David Grossman, who are said to have struck up a camaraderie at the Jerusalem writers’ festival, getting together to hold some sort of Arab-Israeli literary event in the future, with European backing. And so the story is likely to yield further chapters. BUT THE MAIN EPISODE in the story has escaped commentary so far, at least in the English-language reports, and this is Rue Darwin itself. What is this novel, Sansal’s “magnificent text”? It is unquestionably a further volume by the author of The German Mujahid. The same flaws reappear—the schematic quality, the occasional lurid scene or sensationalized detail (gynecological inspections at a brothel, this time), plus an extra added tic for relying on verbal clichés: people marching in “Indian file like the Sioux on the warpath,” “a Saharan Bermuda triangle,” crossing “the Rubicon,” someone as “solid as a California sequoia,” and so forth, which might have appealed to Sansal out of a zeal, or so I imagine, to avoid sprinkling his pages with the sun-and-sand clichés of North Africa. But Rue Darwin also displays the muscular virtues of the earlier novel. The novel is recounted by Yaz, an Algerian of Sansal’s age, born in 1949, who, upon the death of his mother, feels impelled to revisit the impoverished neighborhood in Algiers where part of his childhood was spent. This is the same impulse, to look into one’s roots, that motivates the principal characters in The German Mujahid, the horrified Algerian sons of the German Nazi. Lord God, are these men who speak like this, or have they sold their soul to the devil? Yaz is furious at Islam itself, or at least at the distortions that new-style religious fanatics have wreaked upon the “venerable and festive” Islam of the past. His old neighborhood in Algiers used to be called Belcourt, in the days before the nationalist revolution changed the names of everything—Belcourt with its alleys and tiny medina, where, on the rue de Lyon, young Albert Camus used to live. Camus departed for other shores, though. The neighborhood’s decline since then enrages Yaz. Even in the 1950s and early 1960s, during Yaz’s childhood, the Islamic mystics used to terrify him, the reciters, the “Taliban,” who support their “Pantagruelesque” appetites by bending over cemetery tombs and interrogating the dead and making a dirty little commerce of it. Then the true fanatics came to power. “The earth has revolved since then, and Belcourt is today a different world. None of its old children would recognize it. Freedom, so dear to the people of yore, is an unpardonable sin there. The Islam that reigns as a jealous and vindictive master wishes it thus.” “Belcourt marches to a fatwa.” Not a girl is to be seen. Yaz tries to convince himself that, all in all, things are not so bad. In my eyes the problem was in Islam itself, which pushes its partisans into pride, into exclusivity, which designates its partisans as judges and supreme protectors of the universe even when having trouble feeding their children or getting rid of people who are starving. Too much is too much. Perhaps Islam and the Muslims are simply not compatible. These are narrowly political and religious points, though, and they are not the heart of the novel, even if the anger and the provocations make for zesty moments. In the course of looking back on his childhood, Yaz comes to recognize that he grew up under fairly wild circumstances, and the wildness has left him living a life smothered not just under the public lies of the revolutionary demagogues but under the private and intimate lies of family routine. He recalls that, until the age of seven or eight, before moving to rue Darwin, he inhabited a sort of phalanstery filled with children in an inland village, and all of the children were offspring of the prostitutes in a grand and elegant brothel next door that was run by his altogether folkloric grandmother, the crime queen madame, a marvelous character. But I won’t go on about the plot, except to observe that Sansal’s novel spins a variation on what has become, by now, a dark and fascinating theme of North African literature. This is the taboo topic of sexual secrecy and confusion, and its psychological consequences. Among the jurors of the Arab Novel Prize in Paris this year was the MoroccanFrench novelist Tahar Ben Jelloun—who, by the way, in his own recent book about the death of his mother, Sur ma mère, casually relates that back in Morocco his own family ended up living in what had been the home of the rabbi of Tangiers. Nostalgia for the Jews: a minor but noteworthy impulse in the contemporary North African novel. But mostly Ben Jelloun has looked into this same question of sexual secrecy and extreme repression—a major theme of some of his novels. These books are studies of the most shameful and intimate aspects of sexual life, which (in the case of Ben Jelloun’s novels) might lead a distraught and extremely oppressed young woman to end up fatefully confused about her own female identity, or (in the case of Sansal’s Rue Darwin) might lead poor angry Yaz to be entirely uncertain about who is truly his mother. These are studies of personal identity under conditions of abysmal oppression and fear—a deep theme, proper to the novel. The jury of the Arab Novel Prize did a commendable thing in awarding this year’s prize to Boualem Sansal. And if the ambassadors of the Arab League have ended up embarrassing themselves by cancelling the award—well, the function of novelists is to tell truths that call themselves lies, or fictions, and the function of diplomats is to tell lies that call themselves truths, and probably it was folly ever to imagine that diplomats and novelists could usefully gather in the same room to bestow honors and compliments upon one another. A footnote: political scandals about novels have a history, and the history has a geography, which is worth recalling. Not so many decades ago, political scandals about novels used to break out regularly in the Soviet Union. Lately the geography of literary scandal has moved into the Muslim countries. Looking at Boualem Sansal and his troubles with book fairs and prizes, it is natural to wonder: who will come out on top, the writers or the anti-literary enforcers? The answer is obvious, in the short run. The sword is mightier than the pen. But it is striking that even today, when serious literature is said to have been eclipsed by electronic entertainments, political movements like Hamas and powerful political figures like the ambassadors of the Arab League still fret and tremble over what may have been written by a lonely and vulnerable novelist.